Injection molded parts with realistic surface details 3 propellers and 2 movable rudders Detailed hull, drive shafts, main deck with planking, and control tower 4 detailed 380mm gun turrets with individually movable barrels, 12 150mm guns, 16 105mm anti-aircraft guns, 10 lifeboats of different types Search light with transparent parts 2 Arado 196 sea planes with glass canopy Aircraft hangar doors can be opened or closed 2 detailed cranes with jibs and 2 detailed capstans Display stand Decals for two periods of use: trial phase in the Baltic, autumn 1940 and May 1941 Instruction sheet. Highly detailed plastic pieces May be assembled as a full hull model or waterline model Display stand included Photo-etched parts (3) F1M and (8) E13A aircraft included Anchor chain and propeller shafts made with metal parts Waterslide decals Illustrated instructions. Ready to assemble precision model kit that's an excellent reproduction for display. Build either the waterline version or full hull version. Meticulous main deck detail. The detailed 16-inch and 5-inch guns can rotate. Exquisitely detailed island superstructure. Realistically molded whaleboats, practice loaders and 40mm guns. Ready to assemble precision model kit that's an excellent reproduction for display. Detailed hangar deck including rafts. Completely detailed gallery deck including guns, rafts, boats. Flight deck with realistically detailed island. B-25b, F4F-4 SBD-3, and TBD aircraft. One-piece hull with engraved port holes. Highly detailed plastic pieces molded mainly in grey Waterslide decals Bonus poster of package illustration Illustrated instruction with paint/marking guide included. The United States Navy Aircraft Carrier CVN-65 Enterprise, also known as the ''Big E'', is the worlds largest ship and the first nuclear powered aircraft carrier. Webster defines the word Enterprise as meaning ''Undertaking, Project, A business organization, Initiative, etc. '', and the CVN-65 fits all of these definitions perfectly. A beautifully reproduced static display model that can be built either as a waterline version or full hull version. Photo etched brass detail parts. Exquisitely detailed Pom-Pom, UP mounting, and MK19 mountings. Meticulously detailed island structure. A variety of highly detailed life boats. Complete deck detail including vents, ladders, platforms, etc. Ready to assemble precision model kit that's an excellent reproduction for display. Build either the waterline version or full hull version. Exquisitely detailed flight deck and hangar decks. Meticulously detailed island and main mast. Complete stern detail. Barricade net, missile launchers, Cutter boats and more! Mobile cranes, crash trucks, and tow tractors. On May 24th, 1941 the Royal Navy dealt one of its most shattering blows. The 42,000 ton German battlecruiser Hood was destroyed after an attack that lasted only eight minutes. The Bismarck was the largest and most modern ship in service with the German fleet. 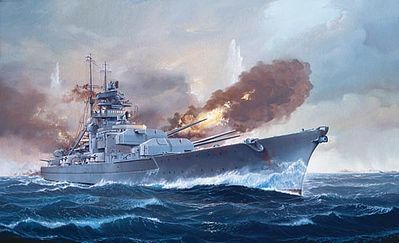 Three days after the most celebrated sea chase of the Second World War, which involved no fewer that three British battleships, two battlecruisers, two aircraft carriers, nine cruisers, and countless destroyers, the Bismarck was reduced to a blazing hulk. Ready to assemble precision model kit that's an excellent reproduction for display. Build either the waterline version or full hull version. Exquisitely detailed flight deck and island. Complete stern detail. Boats and GUNs. The following aircraft included have clear canopies and optional folding wings. © Hobbylinc.com. All rights reserved. Images and Descriptions are representative only, actual items may vary. Prices subject to change without notice. Hobbylinc maintains no responsibility for inadvertent errors. 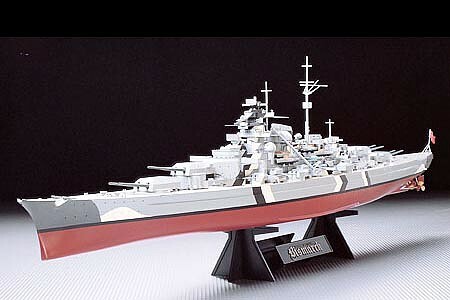 hobbylinc.com is a full line hobby shop which carries plastic model ships, military plastic model ships, scale model ship, military, plastic, model, ships, scale, ship, and much more.